(CBS/AP) HOUSTON - Three elementary school students were wounded when a loaded gun brought to school by a 6-year-old boy fell out of his pocket and fired as he sat down for lunch, officials said. The boy with the gun was among those injured when the gun went off in the cafeteria of the Betsy Ross Elementary School, said Houston Independent School District Assistant Police Chief Robert Mock. None of the injuries was considered life threatening. One bullet was fired about 11 a.m. in the cafeteria, spraying fragments at the students, said Mock. "Either some type of chips off the floor, or it could be pieces of the round that discharged," that caused the injuries, Mock said. "They had some cuts and stuff on their legs, they don't appear to be life threatening." Two 6-year-old boys, and a 5-year-old girl, were all injured in the foot, said district spokesman Jason Spencer. 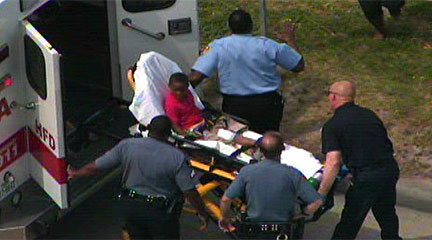 All three children were put on stretchers and taken to ambulances, to be checked out at a hospital. Authorities said they were investigation the source of the gun.